Kenmore sewing machines, made for Sears, are found in numerous households. When your machine begins to preform badly or stops sewing altogether it is time for repairs. Some can be done by the owner and others may require the services of a professional repair person. 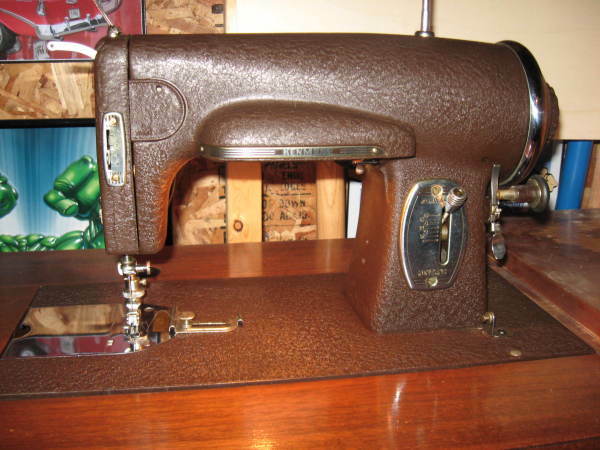 This is a guide about repairing a Kenmore sewing machine. I have been using my great-grandmother's sewing machine for years, and it is just now giving me a problem. When I begin sewing by pushing the foot pedal, it will sometimes start and it will sometimes not. If it does, I have to have the pedal to the floor to keep it going, so I can only sew very fast. If I let it slow down, the machine gets stuck. When it is stuck, turning the hand wheel toward me while pushing the foot pedal gets it going again. When I turn the hand wheel or when it does stop on me, it is always stiff or stuck in the same spot in its rotation. Every time I push the pedal, the motor does run, but I can't always get the needle to move. I have tried everything from cleaning it, disassembling what I can to check for problems, oiling it, and more. Am I most likely looking at a problem with the foot pedal, the motor, an internal belt or gear, or a timing issue? It does sound like a problem with the foot pedal (timing problems usually show up as the needle hitting the plate or bobbin-you'll hear a little clunk every time the needle goes down into the bobbin area). It could be as simple as a worn wire in the pedal, or it could be something more serious. You can try opening the foot pedal housing and giving the interior a look over-take clear photos first and be sure to check the photos before you disassemble anything-you may see the trouble straight off. If you can't see any obvious problems, put the housing back on, check the voltage (should be printed on the bottom of the pedal), and try a different foot pedal in the same voltage to see if that sorts the problem. Foot pedals do go bad over time so that may be the problem. You can also check eBay for vintage Kenmore parts. There is a pressure plate right below the knob that u twist to unlock to wind your bobbin, this is your problem. U can get more life out of your machine without spending money. I have a Sears Kenmore 1410 and the stitch selector knobs are frozen. Is there a way I can fix that myself? When changing the stitch selection on your sewing machine your needle needs to be in the up position. If you are still having issues the knob is jammed and needs servicing. You can take this to your local Sears store for repair. My Kenmore sewing machine 158 14300, selector knob for stitches and also the feed dog lever to lower them is stuck. I just got it at a thrift store. It seems like it is brand new, but from the 1970s? It sews a straight stitch very well now. I don't think the person who had it used it much? I've oiled it in a lot of areas even around the selector knob area. I guess its been sitting too long not being used? What can I do? If it is sewing a good straight stitch but has these other issues, you got a real bargain - now take this vintage sewing machine to a qualified repair tech and have the machine checked over for worn gears (what I suspect is causing your issues) and a general servicing. Kenmore machines (like Singers) were built to last even in the 70s when parts began to be milled from plastics (including silicone) - it would be well worth the cost of the servicing and check-over as most of the Kenmore parts for these vintage machines are still being 'new milled' and the repair tech won't have to use salvage parts to get your machine fully functional. I live in the UK now but spent many happy years sewing on Kenmores whilst living in the US. I do repair-refurb on vintage machines and teach sewing 101 here in Scotland. Unfortunately many of the Singer parts are no longer new milled so I try to steer my students towards new machines to avoid constant breakdown disappointment, but that parts sourcing isn't a problem for the Kenmore machines. I need help with a Sears Kenmore 156-18031. I am unable to remove the mechanism that attaches the feet. As I try to remove the thumb screw, it becomes tighter. If I turn the other way, it it becomes tighter, too. I want to remove it so I can use a different set of feet on it because I do not have the specialized snap on feet for that mechanism. Please help. Thanks for the feedback. I thought about mentioning that I had used a hefty screwdriver to loosen that thumbscrew but chose to be brief. The screw wouldn't budge, turned either "lefty loosey" OR, "righty tighty" This was a very proprietary system for attaching feet on that Kenmore sewing machine. The shaft upon which the feet were attached had 2 holes in it. One to which the foot was attached, and another holding a stout pin. I finally was able to knock that pin out, allowing me to remove the mechanism and change the foot. However, the hole and thumbscrew are specific to that shaft . If I should lose that screw, other screws made for foot attaching will not work in it's place. Again thanks for trying to help me with your "lefty loosey, righty tighty" advice. My Kenmore sewing machine model 158.16800 freezes. I will help it along with the hand wheel, and it goes for a little bit, then freezes again in the down position. You can hear it humming when it's stuck. It is stitching fine when it does move. I don't have a manual so, any help is grateful. Thank you. First of all, it sounds as though the belt is worn, or there is a clump of lint/fluff caught up in there somewhere - but your problem could be a worn gear, too. Best to take it to Sears to have it gone over by a qualified, factory trained repair tech. For under $100USD they will get your machine running smoothly and do a complete servicing with a heads-up to you should there be a looming part fail too. And they'll be able to hook you up with a new manual as well, either as a free PDF download you can then print at home, or as a hard copy (usually spiral bound, win-win!) at a reasonable price. I need a video on how to assemble the thread tension for a Kenmore Ultra Stitch 8. Does anyone know where I can find one? includes instruction diagrams to adjust top thread tension and bobbin thread tension as well. Hope this helps ! The spool pin on my Kenmore 24-stitch (I think it might be a 385, though I'm not sure) fell into the machine. 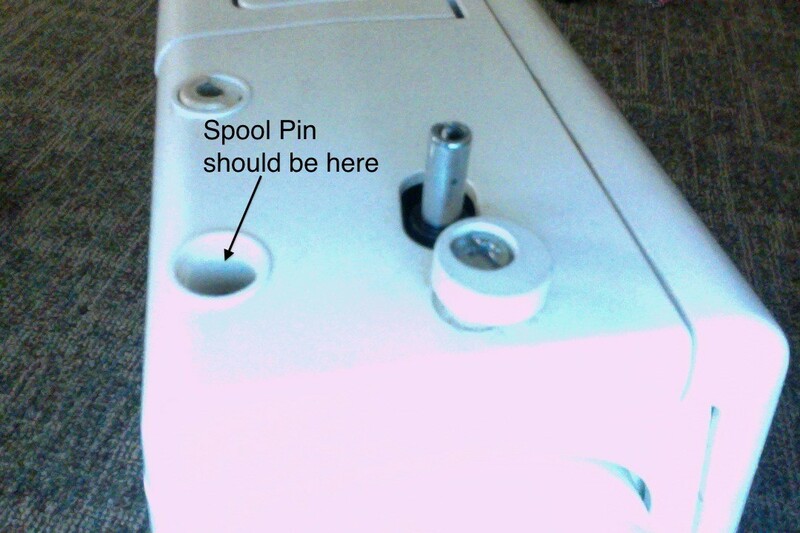 I can't use the machine without thread, and I can't use the thread without the spool pin. How do I go about getting it out? I'm afraid there is no safe way for you to use the machine until that spool pin is fetched out of the machine, and there is no safe way for you to remove it at home - you need to take your machine to a qualified sewing machine repair tech, the retrieval will cost you around £20GBP or $30+USD. Splash out for a servicing which will jump the price to mid-high double digits but is well worth it to keep your machine running well, and to inspect for any damage the dropping pin may have caused. If the machine is under warranty you need to use the Sears authorised repair service techs - either telephone your local Sears, use the 'Net to find their local-to-you service centre, or carefully check all adverts for wording indicating the tech is an authorised service provider or you will void your warranty. 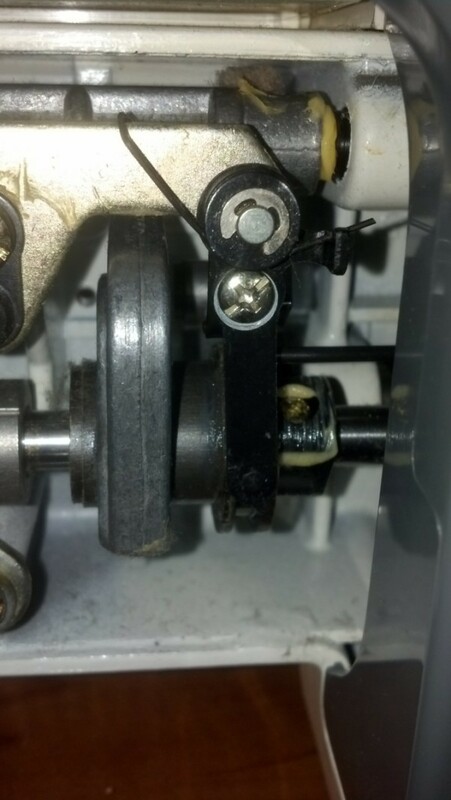 My Kenmore 13550 sewing machine is making a screeching sound in the hand wheel. We have cleaned the machine and oiled it, but the screech continues. Any ideas on fixing it? If there is a belt driving the hand wheel it may be worn, loose or too tight. Perhaps it needs replacing. I have my mother's sewing machine. The motor doesn't seem to have power. I checked the connection; how do we test motor? My Kenmore 385 100 stitch will only stitch backwards, and makes teeny tiny little stitches. It has been "squealing" for a while, but only sometimes and it went to this backwards-only stitch when I tried to sew some words with it, fancy stitches. I bought it in 1997 for $500 and it was a couple years old then. Is it worth repairing? Can I open it up myself? I teach total newbies Sewing 101 and do a bit of self-taught machine repair and refurbishment here in the UK where I've retired after 50+years in the US. I'm not familiar with Kenmore machines but my experience with Singers tells me what you're describing is very likely a belt failure. If not a belt, it might be a silicone-plastic-rubber part failure although I've never had a part make that sound you describe - that sound is 99.9% surely from a belt warning of failure. The only other possible is a wad of thread fluff/lint caught somewhere deep in the machine - bottom line is none of these are home repair possible unless you're a factory trained or very talented self-taught repair tech completely familiar with that particular model and in possession of the hideously expensive service manual (vastly different from the standard 'user guide/owner's manual that comes with a sewing machine. One of my Singer service manuals cost me $700USD in 2009, I believe Kenmore manuals are comparable in price). Without proper training and access to tools specific to sewing machines, you are best advised to take this machine to the nearest Sears repair centre - they're factory trained on all models of Kenmore sewing machines including vintage machines like yours. They have the knowledge and correct tool-bag to ensure they can repair your machine and then put it back together in a way that means the machine will still function once reassembled - don't laugh, countless 'basket-cases' have been brought to repair centres. What is a 'basket-case'? Owners hoping to save money decide to open the machine, take the thing apart and then are not only unable to find and fix the problem, they have no clue how to put the machine back together! They finally give up, sling everything they can find into a box/bag/basket, and tote the container to the pro for rescue - hence the name 'basket-case'. Basket-cases are VERY expensive to have a qualified tech work on. Avoid being the owner of a basket-case. Take it to a pro. Be sure to ask for an estimate before the repair tech does any work and ask him/her to include a 'repair worth' estimate - it may be a comparable replacement with a new machine (under warranty and with all kinds of accessories!) 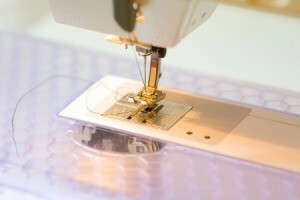 is a more cost-effective and sewing satisfaction option. A new machine will have been built with the latest technology (not always a good thing, but more often than not, is), and will come with a warranty, training sessions from the sewing centre, and lots of shiny new accessories that do all kinds of really cool things you couldn't do with the old machine. Sometimes sewers do choose to have the old machine repaired as there is a specific function on the old machine they feel cannot be replicated on a new machine. I have a mid-sixties Italian built Singer that I know is a 'money-pit' machine - finding repair parts for that old a machine means I often have to use salvage parts with sketchy lifespans so I'm not getting many sewing hours from it but I do love the straight stitch on this machine, it's the best I've ever-ever-ever got from a heavy duty machine - lol, it's a real money-pit but I keep it going just for that one stitch! The stitch length knob fell off my Kenmore 158.901 sewing machine when I was adjusting the stitch length back and forth to start and stop my stitching with a very small stitch. I was able to get it back on my machine, but the stitch lengths are way off from what they should be. When I set it on 1 there is no length at all and I have to set it on 2 to get a very tiny stitch. I was setting it at about .5 to get a tiny stitch to lock my stitches. How can I recalibrate this knob back to where it should be? Take this machine to the nearest Sears repair centre - they have the skills (they're all factory trained and have the right tools and knowledge) needed to do the recal. Please believe me this is NOT a home repair job. I was giving my aunt's Kenmore sewing machine. It's a 1800 model. I used it to make a dress and vest, but now the needle won't go up and down. I thought it was the motor belt and replaced that, but it still doesn't work. Could someone give me an idea? The best suggestion I can make (as a sewing teacher and self-taught sewing machine repair tech) is to take it to a qualified Singer sewing machine repair tech. Any sewing centre will be able to help you. The trouble you're having with your vintage machine could have so many causes there isn't room here to go through the list, but the list begins with: when was the last time this machine had a full servicing including cleaning, oiling, and checking the workings for problems or potential problems? Only a qualified tech can help you at this point, and you'll either have a machine in perfect working order, or the bad news the machine is past saving. My 7 year old Kenmore 385 stopped working yesterday. It won't let me turn the hand wheel or foot pedal, even though it's not jammed. I took it to a repair center and the man said it looked like it needed to have the bobbin casing cleaned and oiled as well as having a piece next to it oiled. Is this something I can do myself, cause they wanted to charge $100 for it? A seven year old Kenmore should be a fairly complex machine but $100USD seems a bit steep even with the complexity. $100 should cover a full servicing, not just oiling the bobbin casing and an adjacent bit. Ring him/her back and ask if that $100 covers a full servicing. If no, get a second opinion - $100 is too much for just that wee bit. I have a Kenmore 24 stitch sewing machine that my grandma gave me. When I push the button for the backstitch to work it won't. I opened the bottom and tried unscrewing where the lever meets the 2 inch flat bar. The lever will move to the left, but the bar will not more. Is the spring supposed to move the bar away from the spinning mechanism? Please take this machine to the nearest Sears service centre - it looks as though the silicone on at least one of the gears is failing, the belt may be worn, and the spring on a Kenmore has a specific direction it is to go. I'm not familiar enough with Kenmore machines to advise, I do vintage Singers (in the UK) and the 'innards' look just different enough to make me advise you to take your Kenmore to a qualified factory trained tech. My Kenmore 385 won't do anything when I press the pedal down, but the light does come on when I turn on the switch for it. I can turn the hand wheel and the needle goes up and down. Engaging or disengaging the clutch with the hand wheel doesn't change anything, either. It was working fine the last time I used it a few weeks ago, but this time it doesn't. Does anyone know what might fix this? The problem could be a wire inside the machine or the pedal (or a gear, but it sounds more like a wire) has failed, or the wattage-voltage on foot pedal is not matching the machine - have you recently replaced the foot pedal, or has it been dropped or had a lot pressure on it whilst not in use? To check wattage-voltage, roll the foot pedal over to see the rating sticker and compare it to the one on the machine (usually by the connector point for the foot pedal). To be honest, the only safe fix for this is to take it to a qualified repair tech. Either contact Sears or check adverts for a 'Kenmore authorised repairs' tech or centre. I have a Kenmore mini Ultra, and the foot is not raising so the fabric can move as I'm sewing. I've barely used the machine and it seems like a hardware problem, but I'm not sure what to do. Thanks! Is it still under warranty? If yes it's worth it to take it to the Sears repair centre to have it fixed. It does sound like an internal part has broken through no fault of yours and so should be covered under the warranty. After sewing a few stitches on my Kenmore machine the thread will curl around the thread guide and come loose at the top of my machine at the point of the thread guide. I've had this machine for years and this is the first time I've experienced this problem. Do you have any idea what would cause this? My first thought as a sewing teacher and self-taught repair tech is that there is a burr in the part the thread is tangling in - it may be an easy repair you can do at home if the part is attached on the outside of the head. Scroll down to the 3*'d paragraph. **About vintage electric machines: Many reasons you may be reluctant to splash out on a new machine - it was the machine you learned to sew on/it was your gran's, mum's/you sewed your wedding dress/baby's christening gown/all your children's clothing/your daughter's wedding dress on/the features and quality of stitches on it are amazing and replacing it would cost hundreds of dollars. But vintage electric machines have a lot of plastic and silicone parts that do wear down and fail. So eventually you will have to take a decision - repair or replace. If your repair tech can source newly milled parts, great! Have it repaired and enjoy many more hours of sewing! But if he/she has to use salvaged parts, well, it's time to buy or start saving to buy because those salvaged parts could be off a machine that was abused by the previous owner - you never know how many sewing hours are on a salvaged part and you never know the conditions that poor thing laboured under. My vintage Kenmore sewing machine's pressure foot won't go up or down. The handle just moves freely without lifting the foot. How do I fix it? Check to make sure the bobbin winding feature isn't set; check to see if the presser foot lever has been loosened, and finally, check to be sure the presser foot is actually connected to the lifter lever. If none of that helps it is time to call Sears and schedule a visit with the Kenmore repair tech.